Kadappa is very popular in Kumbakonam (A famous temple town in the Tanjore District of Tamil Nadu State in India) and surrounding areas. Every area around Tanjore side has their own Kadappa recipe version. One of my friends shared her Thiruvarur kadappa version which is comparatively thin in consistency than the Kumbakonam version. But both versions are super yummy. 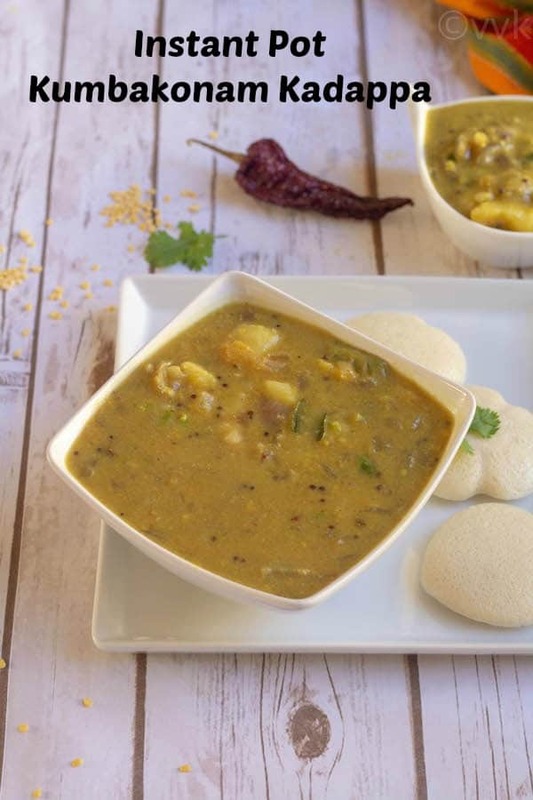 They serve idli or dosai with kadappa, traditionally kadappa is paired with idli. Last year during our Kumbakonam trip, I was able to relish this dish more than once. I tried in the SitaRama Vilas hotel in Govindapuram nearby by Thiruvidaimarudur and also in Kumbakonam. As always I wanted to try this in my kitchen as well. I decrypted the recipe a bit and found the recipe at Sharmi’s passion which was very close as well. I did change the ingredient portions and made it less garlicky. The kadappa always reminds me of the Tirunelveli Sodhi. :-) Maybe because of the moong dal and potatoes. 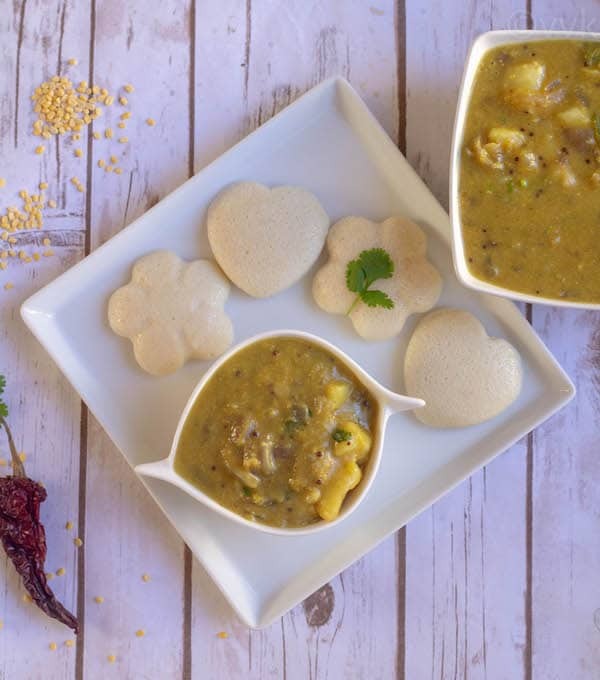 Kadapa recipe is super simple. We need to boil the potatoes and moong dal. Meanwhile, make the masala and cook everything together with simple onion tempering. I have shared both IP version and the pressure cooker version below. I usually cook the potatoes and moong dal in the IP before going to work. Sometimes I do “delay start” as well. After the cooking part is complete, the IP goes to keep warm mode automatically. As it doesn’t need any supervision, I happily turn the IP on before going to work. In the evening, I peel the potatoes and prepare the masalas and do the tempering part alone. But you can do the sautéing part first and then pressure cook the moong dal and the potatoes along with the masala. In this way, you avoid that additional pot rinsing and not much wait time as well. If you want to follow this way, then here are the steps. First, do the tempering and saute the onions. Add the ground paste and cook for 5 minutes. Then add the moong dal, peeled and chopped potatoes and water. Pressure cook this for 5 minutes and let the pressure release naturally. Also, here is the detailed video of the Kumbakonam Kadappa. Please subscribe to my channel for new videos. Please like and share and help me spread the word. Chop the potatoes into two halves. Rinse the moong dal once and add it to the IP. Then place the chopped potatoes inside. I kept it upside down so that it won’t be wobbly. Then add the 1/8th tsp of turmeric powder and 3 cups of water. Set the IP in manual mode and pressure cook it under high pressure setting for five minutes and allow the pressure to release naturally. Carefully remove the potatoes and the moong dal to another vessel and rinse the instant pot once. Now set the pot back and keep it in the sauté mode and add the oil. When the oil is hot, and then add the mustard seeds, bay leaf, cinnamon stick, cloves, and the curry leaves torn into small pieces. Allow the mustard seeds to splutter. Then add the chopped onion and cook until it is translucent. Meanwhile make a paste of the coconut, green chilies, fennel seeds, and garlic by adding 2 to 3 tbsps of water. I used the moong dal stock water. But you can use regular water as well. When the onion is soft and cooked, add the ground paste and mix well. Add 2 tbsp of the moong dal water or regular water and allow this mix to cook for at least 5 minutes or until the raw smell goes away. Parallelly, you can peel the skin of the potatoes and mash them roughly. After 5 minutes, add the cooked moong dal, mashed potatoes, and the salt. Mix thoroughly and let it simmer for 5 minutes. And that’s it kadappa is ready. Garnish it with cilantro and serve it hot with idlis or dosai. Pressure cook the moong dal and the potatoes for up to two whistles. Let the pressure release naturally and when the pressure is release peel the potato skin and mash it roughly and also the dal. Heat a pan or kadai and add the oil. When the oil is hot, then add the mustard seeds, bay leaf, cinnamon stick, cloves, and the curry leaves torn into small pieces. Adjust the salt and the green chilies according to your preference. 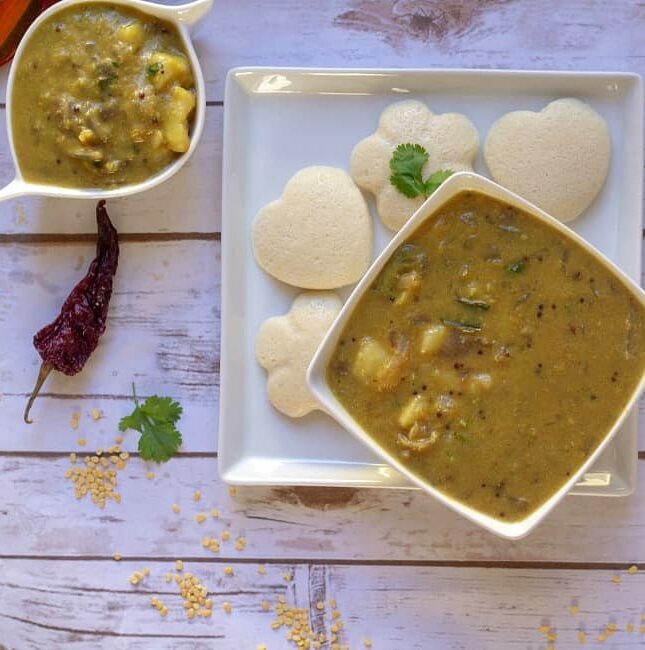 You can include about a tsp of roasted gram dal or pottukadalai while grinding the masala. It binds and helps in thick gravy. Adjust the amount of water according to your consistency preference. 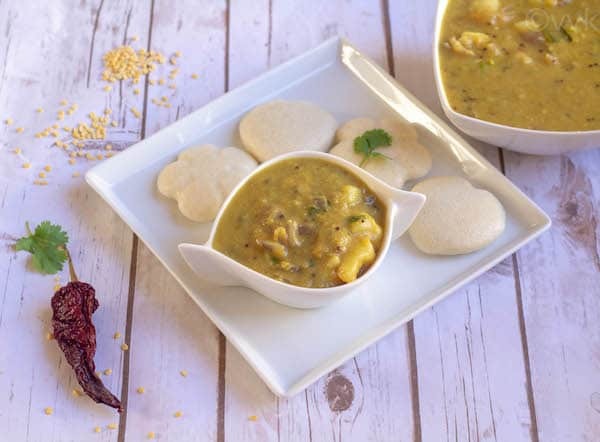 The delicious Kumbakonam Kadappa / Potato and Moong Dal Gravy or Stew - a famous regional recipe from Tamil Nadu prepared in Instant Pot. 1 Big Red Onion when chopped it was 3 cups approx. Then place the chopped potatoes inside. I kept it upside down so that it won't be wobbly. And that's it kadappa is ready. Garnish it with cilantro and serve it hot with idlis or dosai. PS: Updated the post with new pictures, video and the instant pot method. Hi…excellent recipe and for sure will try this out… the YouTube video made it alot more easy. Could you please do video on vegetables kurma and tomato kurma. Now days back home in Coimbatore I here many cooking tomato kurma served with appams. Honestly m not getting the correct recipe for the tomato kurma. Thanks a lot. Will definitely post more kurma recipes in the upcoming weeks. Thanks much for the support and feedback. I also yet to try it. Seems like a simple yet flavorful side dish. This is new to me. It sounds delicious. 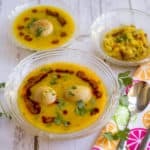 That is such an interesting dish with potato and moong dal. Looks so delicious. Its delicious and easy to make too. Yes I have heard about this so often that I am tempted to try this myself! Heard about this recipe a lot, yet to try on my own.Well made & nicely presented. Kalakra Sri.. I missed ur series.. This s my favorite. It has been on my to-do list for a very long time now. Sounds very flavorful. Thanks Usha do give it a try. This sounds very comforting meal.Lovely.. This one is still in my to do list thanks for the recipe looks yummm…. This is something I would love to try!